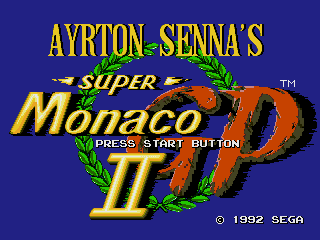 Ayrton Senna’s Super Monaco GP II is an arcade-style Formula One racing video game developed and manufactured by Sega, and the follow-up to Super Monaco GP. Along with boasting the most “realistic physics”, it was the best received console driving game at the time of release, the game was also endorsed by the then Formula One champion Ayrton Senna, who won the race more times than any other driver, with six victories, and five races consecutively between 1989 and 1993. The game’s development was also assisted by Senna, who supplied his own advice about the tracks featured in the game.